Do you love chocolate? Stupid question I know…. I ADORE chocolate, but I also love nourishing my body with foods that have amazing health benefits, and so this recipe is a fusion of the two – the taste of chocolate with a superfood nutrient boost! Healthy chocolate…. you can thank me later! 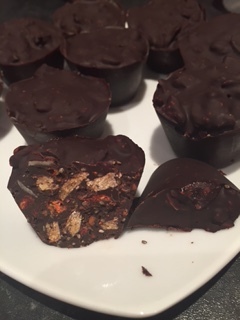 The beauty of this recipe is that it can be adapted to your taste, so you can mix and match the fillings to your hearts content – and not only that, you can make either bigger, dessert-sized “cups” as I did here, or smaller individual chocolates to serve with coffee or even give as a heartfelt, handmade gift. So how do you make these healthy cocoa treats? Melt the chocolate, coconut oil and maple syrup over a pan of boiling water – melt it gently until you have a smooth liquid consistency. As the chocolate is melting, in a separate bowl crush the oatcakes until you have large crumbs, then stir in the almonds, goji, chia and bee pollen until combined. Once the chocolate has fully melted, remove from the heat and then stir all the dry ingredients in until fully combined. Transfer to a silicone mould tray – I used a mini muffin tray to make “cups” to be served after dinner, and this recipe made 10 cups. If you want to make smaller, truffle sized portions then use a chocolate mould tray and you should get around 14-16 truffles. Once the tray is full, pop in the freezer for around an hour, and then once they are set remove from the moulds and either store in an airtight container, or leave out at room temperate for 10-15 minutes before serving. As long as these are stored somewhere cool and dry they should keep for up to a week.